The world's first LEGOLAND Water Park features more than 20 LEGO models including giant LEGO friends who splash or spray water on guests. The centerpiece is a 45 foot tall tower designed to immerse children in the creative world of LEGO. This park also has snack carts, retail shops and 2 sandy beach wading areas. The best time to visit LEGOLAND Water Park during the summer is between 10:00am - 1:00pm and 3:00pm to closing to avoid the peak visit time between 1:00 and 3:00. The water park is only accessible through LEGOLAND. 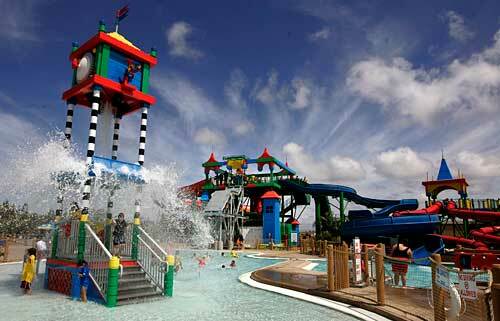 You must also purchase an admission to LEGOLAND in order to access the water park. Check out the Go San Diego Card, you can save up to 55% and it includes LEGOLAND. When it comes to purchasing tickets, LEGOLAND offers many different packages. From single day tickets to park hoppers to Premium play passes. No group discounts. They have different pricing for online tickets vs pay at the gate. Phew! This can get expensive! Please consider getting a sightseeing pass to save money, especially when you're buying multiple tickets. Find the best deal, compare prices, and read what other travelers have to say about these hotels. I have not personally stayed at any of these places so click on each one and read the reviews before you make reservations. The closest one to the park is first.